Welcome to the Crazy Crafters' Blog Hop with our Special Guest stamper, Jeanette Egemann - we are thrilled to have Jeanette join us this month and so excited to CASE (Copy And Selectively Edit) any project that has been created by her . To the left you'll see Jeanette's card that I have chosen to CASE. I was attracted to the design (the strip of pattern with the circular greeting) and the two-tone effect of the stamped pink flowers on the lighter pink cardstock. The coloured decoration is all one layer with the circular greeting adhered on top. Apart from the colour, I changed things up a bit by stamping the decorative strip as just one layer and adding a die-cut greeting. 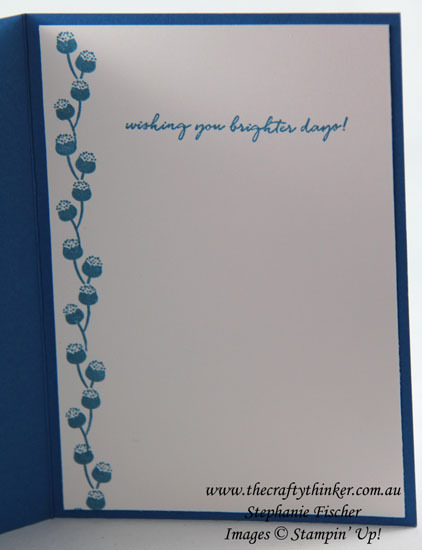 I masked off a portion of card and sponged it with Soft Sky ink. Then I stamped the floral image (I think they look like gum nuts?) with Pacific Point ink. Having removed the masks, I stamped the decorative strip from Floral Phrases along one side in Pacific Point ink. Then, using masks to protect the white and blue areas, I sponged on some Sahara Sand ink. I used a ruler and Sahara Sand Stampin' Write Marker to add the line on the left side of the blue strip. A little bit of bling can never be a bad thing! I cut some Sahara Sand cardstock with a circular Stitched Shapes framelit and layered a circle of Whisper White cardstock on top of it. I cut some Pacific Point cardstock with one of the Lovely Words thinlits and then trimmed the word to fit on top of the circle and glued it in place. The last step was to add some Rhinestones. The base card is Pacific Point with a layer of Sahara Sand and then the decorative layer on the top.